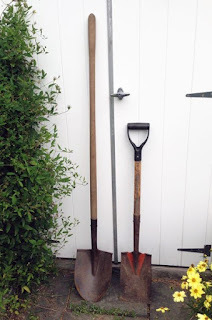 A shovel [left in the embedded photo] has a broader blade that is curved inwards from left to right and is rounded or pointed at the tip. Blade length and shape can vary, depending on the intended use – you’ll find shovels with extra long blades, saw-tooth edges, and ledges down the sides. The shovel blade tends to be larger than that found on spades. 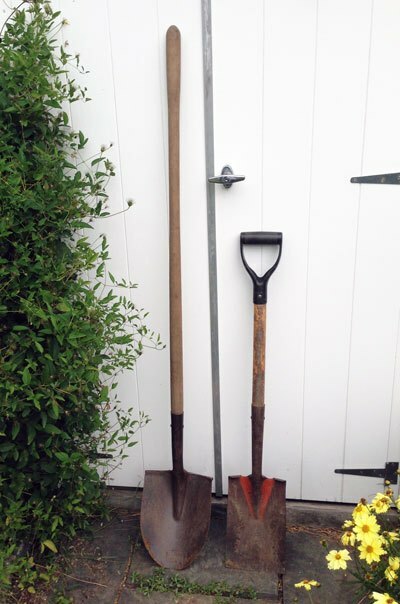 A spade [on the right] generally has a relatively flat blade with straight edges. It’s smaller than a shovel (although size does vary, depending on use) and the blade tends to be in line with the shaft, rather than angled forward. Further explanation and photos here. 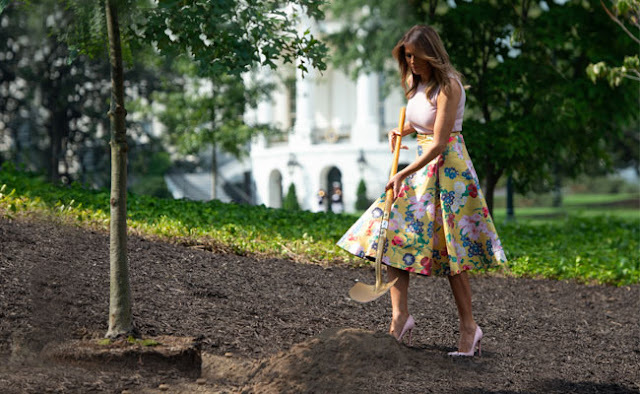 TYWKIWDBI has absolutely no objections to someone wearing a $4,000 skirt while gardening, or for opting to aerate the soil with 4-inch heels. Those aspects are commented on at NDTV. I always thought it was the other way around, with a spade looking like the spade shape on a card deck. I second Zhoen's comment. Why is a playing-card spade called a spade and not a shovel? In Switzerland, the suit is known as Schuufle ("shovel") and in many German regions, e.g. the Rhineland as Schüppe/Schippe ("shovel"). the easiest way to remember what is a spade, and what it looks like, is to recall the label of that well known, and good tasting, german beer 'spaten'.